Alarms were set for 5.30 AM and we were in a 4X4 to Taddart by 6.30 AM. 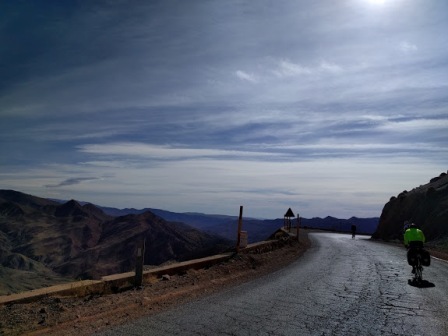 The first mission of the day was to climb Tizi-N-Tichka. The first few kilometres were a construction site with a lot of loose gravel on the road. After a while there were no more JCBs and the climbing became a lot easier (and more fun?) on the smooth wide roads. Romain reached the summit first and straight away the hawkers at the top of the 2260 metre pass started harassing us to buy statues and other rubbish. We had just climbed for 14km and weren't interested. 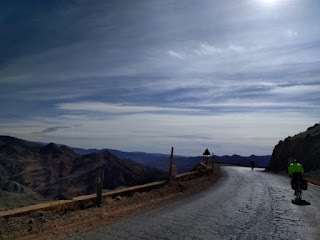 The initial descent began on great roads for a few kilometres before we took a left turn to Telouet where the road narrowed but was still pretty solid. 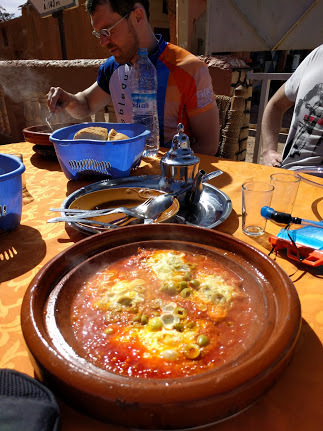 We stopped for lunch of egg tajines in Telouet before continuing on to the worst descent I've ever been down. The road was non existent and in its place were dust and rocks. Serious punishment for our wheels. 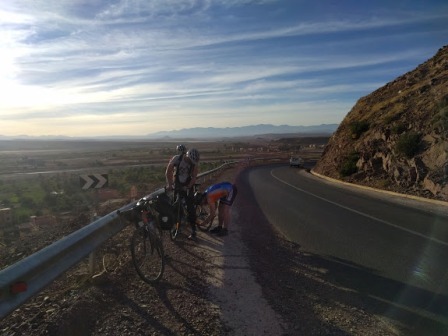 Luckily after a few kilometres the road conditions improved dramatically however soon afterwards Paddy suffered his first flat of the day. Romain and John went ahead while we patched the tube and then set off in pursuit. After another 20 minutes or so Paddy's other wheel punctured. After another 2 punctures we put a fresh tube in and thought that the problems were over for the day. 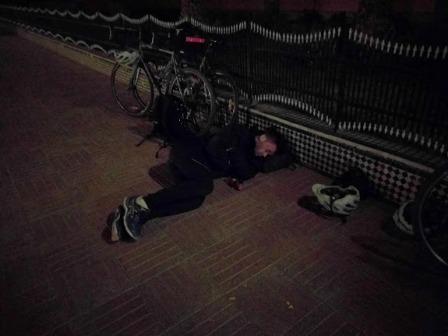 By the time we'd reached Romain and John we saw that John had a puncture. We repaired this and continued on. A few minutes later Paddy's pedal fell off and couldn't be found. The next town was only a few hundred metres up the road and we managed to buy a spare which just about stayed in (with some help from duct tape) since the threading in the crank was destroyed. Despite these minor setbacks the route from Taddart to Ouarzazate (via Telouet) is one of the most amazing routes that I've done. 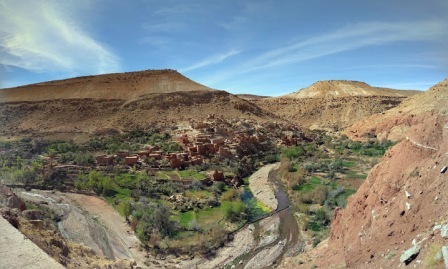 Every few minutes a Kasbah (fortress) appears on the side of the road and the valley that runs alongside the road is an oasis of green in contrast to the red earth colour of the rest of the scenery. 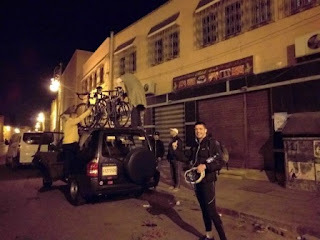 We arrived in Ouarzazate well before dark and at this point I noticed 2 broken spokes on my back wheel which shouldn't be too much trouble to repair. Our airbnb host picked us up in this 4X4 and brought us out to his farm where he made a tagine for dinner. 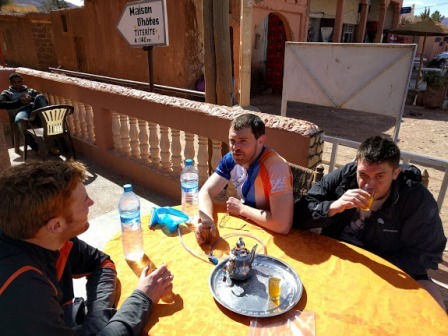 We had bought beers in Ouarzazate but struggled to even drink one each after such a long cycle and the big dinner.